Meyer Tool attends the 2011 Particle Accelerator Conference (PAC '11) - Meyer Tool & Mfg. 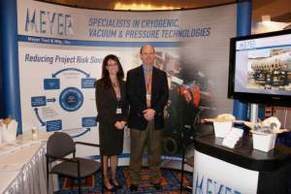 Meyer Tool & Mfg., Inc. enjoyed participating in the 2011 Particle Accelerator Conference (PAC ’11) which took place in New York City from March 28 to April 1, 2011. PAC ’11 was set against the backdrop of the beautiful Marriot Marquis, a hotel located in the heart of bustling Times Square and known for their innovative elevator system, among other amenities. This exciting venue allowed Meyer Tool’s Ed Bonnema and Eileen Cunningham to experience delicious meals, entertainment and, of course, a little shopping after show hours. Thanks to Stuart Koch of Amuneal, Eileen even tasted matzo ball soup for the first time ever! And all we can say is “Wow!” Times Square really is in motion 24/7! 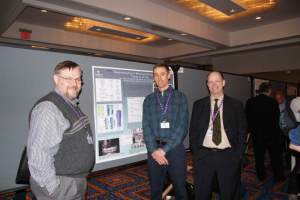 PAC ’11 was hosted by Brookhaven National Laboratory (BNL), and jointly sponsored by the IEEE Nuclear & Plasma Sciences Society and the APS Division of Physics of Beams. Meyer Tool would like to give a special thanks to Doreen Cantelmo of BNL for all her planning efforts this year. Doreen was our contact for PAC ’11 and did a great job on the Local Organizing Committee for Industrial Exhibits. PAC conferences are organized to attract accelerator scientists, engineers, students and industrial exhibitors interested in every aspect of the science and technology of particle accelerators. To that end, they achieved their mission. Despite national budget uncertainty, there were approximately 880 attendees and 162 conference exhibitors and enough conservative optimism to go around. As always, it was impressive to see the number of students involved in accelerator science. We can be optimistic about America’s future as our higher education system and our scientific communities continue to engage bright minds with bright ideas! Speaking of bright ideas, during Tuesday’s poster session, Meyer Tool presented our poster on the “Fabrication of the Jefferson Laboratory Cryogenic Control Reservoirs” (CCRs). Meyer Tool is manufacturing six (6) CCRs (cryogenic distribution boxes designed by JLab) as part of the 12 GeV upgrade to the CEBAF accelerator. They include internal reservoirs in order to provide a continuous supply of liquid helium and liquid nitrogen to superconducting magnets through periods of disruption in the external supply. 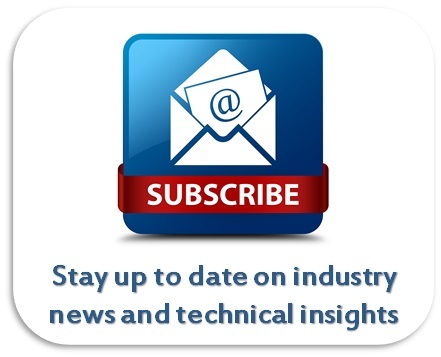 The paper discusses the manufacturing and process measures that we implemented in order to meet DOE requirements for pressure vessels, to eliminate brazing flux contamination and to reduce weld distortion in multiple internal vessels. ​Often, a benefit of these engagements is that those who were once just business acquaintances are now also considered friends. We certainly look forward to the opportunity to catch up with all the familiar, friendly faces we’ve come to know and respect through our attendance at PAC. 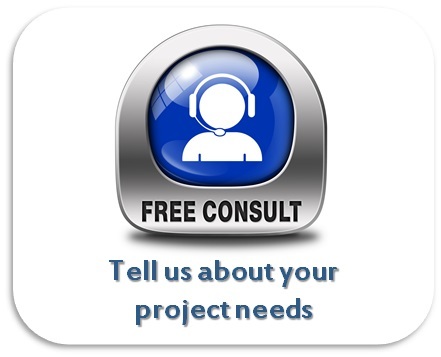 We enjoy the chance to meet new faces as well; ones that we hope to know, befriend and engage with in the years and projects to come. So, thanks to all who hung out with us during PAC‘11 week. We look forward to seeing you again soon! 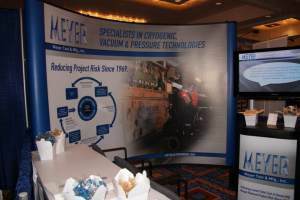 Meyer Tool’s booth at PAC '11. Eileen Cunningham and Ed Bonnema at the PAC '11 booth. 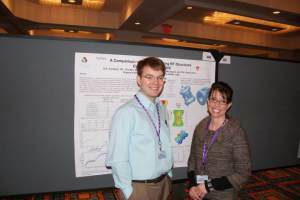 Zack Conway, ANL and Eileen Cunningham, Meyer Tool at Zack's poster. 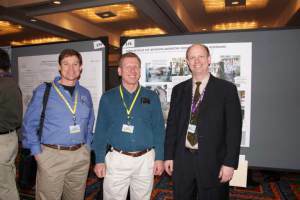 Mike Kelly, ANL and Ed Bonnema, Meyer Tool at Mike's poster. 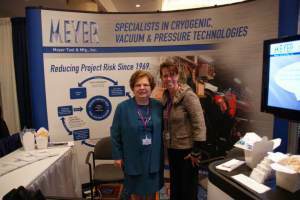 Laurie Huget, Cryogenic Society of America and Eileen Cunningham, Meyer Tool. 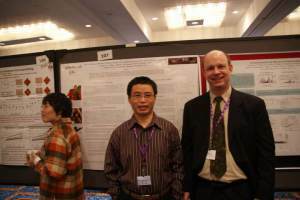 Gary Cheng, Jefferson Lab and Ed Bonnema, Meyer Tool at one of Gary's posters. 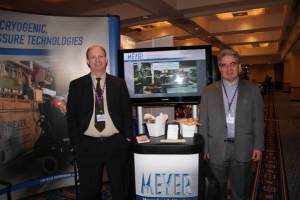 Peter Ostroumov, ANL (right) and Ed Bonnema, Meyer Tool. Bruce Strauss of the Department of Energy at Meyer Tool’s booth. 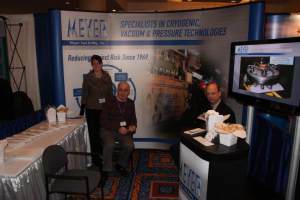 Doug Holmes and Joe Deacutis of Advanced Energy Systems with Ed Bonnema, Meyer Tool, and Meyer Tool’s poster.